I was like ugh pick a mood boy, yeah who could go one being mad at Edward? I couldn't even if you don't know him and I had a pretty good mental image of him and I know I wouldn't stay mad at him. I knew this was a vampire book and I was guessing he was a vampire so I figured it was something to do with that. I just thought that she was very independant, that really helped me to connect to her character more. I really thought that it was cute that Charlie couldn't cook and I always thought it was nice that Bella made dinner every night, it was a kind of bond between father and daughter. I really don't know what I thought when he showed up and started being nice, I guess I thought he was trying to make up for being so rude earlier becuase he finally got a grip on him self. I thought it had to do with his mood originally and that when he was angry his eyes got black but when he was calm they were the golden-brown color. I thought maybe he had taken a few personal days, but I didn't think it was 100% Bella's fault at first. Obviously that Bella is going to be a very independent individual because her parents are obviously lacking the skills to take care of her. She probably grew up taking care of her mom. Character trait: wise beyond her years. 2. We learn a few things about Bella's parents in this chapter. Charlie can't cook - Renee is rather needy and so on. What does this tell us about Bella as an individual? she's independent & can take care of herself. 3. What was your reaction to the polite way Edward treated Bella when he returned? Did you think he was putting on a show? How did it change your thoughts about his initial reaction to her? I thought he was being one of those people who are polite w/their friends but can be jerks to anyone else (it is high school) and I thought he was just trying to put on some sort of show. 4. What was your first explanation for the change in Edward's eye color? I figured he was lying & did have contacts. I had no idea where he'd gone. Staying at home maybe. I thought it had something to do with Bella, that he needed some time to think. But I did not know why. I tells me that Bella is a strong person, independent. You also see that in the way she thinks and talks about things, that she she is not your average teenager. More mature than her 17 years, and I guess that is also why she relates so well to Edward who has gained a lot of "life experience". I thought that he was genuinely a nice guy, and the he was trying to show that side of him. I did not think it was just a show, he was trying to make up for being so rude. And I also thought that he actually liked Bella as a person and was curious and interested in her. I still thought that his initial reaction was strange, maybe even more so now that I saw what a nice person he really could be. A vampire thing..My initial guess was that it had something to with his mood. Bad mood=black eyes. Well, because I didnt know him, I didnt really think anything special. Maybe he was at home sick? or away on a trip. The thought just never hit me, that it was because of Bella. That when she grew up, she learned to take a lot of responsability. That she doesnt really need anyone to depend on, she can manage by her self. She is "older" than her age, if that makes sense? On the other hand, she is also a normal teenager, who doesnt really know who she is, and what she wants. This is starting to sound kind of complicated.. forget what I just said. It seemed a bit strange at first.. but I didnt really think about it that much. I knew that there must have been something behind it, but yeah.. I just kept on reading. 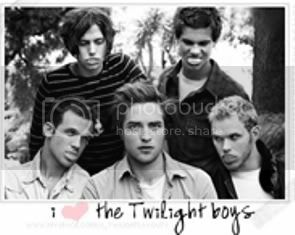 Well, I kind or knew that there was something special with the cullens. And that they probably were vampires. But ehm.. I must be kind of boring, but to be honest, I just kept on reading the bok. she mature for her age. I already knew, because I'd read Dark High Noon before reading Twilight. That she's very mature for her age, and very caring. Capable, responsible, and comfortable in her own little well run zone. -Again, question 1; I spoiled a lot of Twilight for myself, didn't I.
I figured he was..not there...smart of me huh?? It seemed like it must have something to do with Bella and his reaction to her on her first day. Bella takes care of other people, she is like a parent to her mother, and cooks and does things for Charlie...she'd not very selfish or needy herself, she can get by fine on her own. ..Well I knew it was a vampire story, and he was a vampire..so I figured it had something to do with that, and whether or not he had had any blood lately or something..
Well, I knew he vanished b/c of Bella. I didn't know where he was, maybe at home. It really gives us our first glimpse of the caretaker element of Bella's personality. I had no idea, really.